My great-great-great-grandfather Andrew Lewis Sias participated with the 34th Battalion Virginia Cavalry (Co. D) under Maj. Gen. J.E.B. Stuart at Gettysburg and was thereafter captured (according to one military record) on July 8, 1863 in Funkstown, MD. He was held at Seminary Hospital in Hagerstown, MD, then admitted to General Hospital in Chester, PA, on September 17, 1863. He was thereafter sent to Hammond General Hospital at Point Lookout, MD, on October 4, 1863. 9 April 2015. Photo by Mom. The Battle of Funkstown, a Confederate victory, occurred shortly after the Battle of Gettysburg. My ancestor missed this battle, having already been captured. 9 April 2015. Originally named Jerusalem in 1767, the town was incorporated as Funkstown in 1840. 9 April 2015. Major H.D. McDaniel of the 11th Georgia Regiment was treated here at the Keller Home after the Battle of Funkstown (July 10, 1863). Mr. McDaniel survived the battle and later became governor of Georgia. 9 April 2015. Part of the Keller Home. 9 April 2015. Dozens of beautifully-designed old residences are yet visible in Funkstown. 9 April 2015. Funkstown’s population was 904 in 2010. 9 April 2015. Most of my favorite old structures in Funkstown were located on this street. 9 April 2015. One of the farming population of Jefferson district, Lincoln county, was born in Fayette county, (then) Virginia, in 1835, and he is a son of James and Rebecca (Adkins) Sias, who came to Lincoln county in 1857. Sallie R., daughter of Bradford and Sarah B. (Thomas) Hill, was born in Boone county, (now) West Virginia, in 1852. Her parents settled in Lincoln county in 1852, and in this county, in 1871, she became the wife of Evi Sias, and six children are the result of their union: Sarah B., born July 8, 1872; Rebecca A., November 28, 1873; Olivia F., September 4, 1875, died in August, 1877; James B., October 22, 1877; Ira, September 28, 1879; Lelia, January 14, 1882. Five brothers of Evi Sias served in the late war: Isaac, James W., Noah, and Henry C. were in the Federal service, and Andrew L., joined the Confederate ranks, and was wounded at the battle of Gettysburg. Evi Sias was elected justice of the peace, and in 1880 was re-elected; he is commissioner of reassessments of land and secretary of the board of education in Jefferson district. Mr. Sias has been a strong advocate of free schools, and taught the first free school in Washington district, Boone county, and the first in Union district, Lincoln county. He has a farm of 100 acres on the Left Hand fork of Mud river; a part is heavily timbered, contains mineral, coal and iron ore, and the remainder in cultivation, with a large orchard. Evi Sias is a member of the Missionary Baptist Church, and a man respected by all. Address, Spurlocksville, Lincoln county, West Virginia. Source: The West Virginia Encyclopedia, Vol. 7 (Richwood, WV: Jim Comstock, 1974), p. 148. NOTE: I descend from Evi’s brothers, James Wilson Sias and Andrew Lewis Sias. Andrew Lewis Sias is one of the farming population of Hart Creek district, Lincoln county, and owns 87 ½ acres of land on the East fork of Fourteen Mile creek, 45 acres well cultivated, the rest heavily timbered, and coal, iron ore and building stone are to be found on the farm. Mr. Sias was born in Mercer county, (now) West Virginia, May 28, 1842, and was married in Lincoln county February 10, 1867, to Martha Ellen Lambert, the Rev. John Lucas officiating clergyman. The children of this union were born as follows: Jeremiah, November 25, 1868; Delilah Jane, March 1, 1870; Henry C., September 5, 1872; Lena L., March 8, 1874; Charlotte, November 5, 1876; Mary Etta, April 25, 1880. The parents of Andrew Sias, James and Rebecca (Adkins) Sias, have resided in Lincoln county since its organization. Mrs. Andrew Sias was born in Tazewell county, Virginia, April 12, 1848, and her parents, Jeremiah and Sarah (Hedrick) Lambert, were residing here before the county was organized. Andrew Lewis Sias enlisted in the late war, in Company G, 22nd Virginia Volunteer Infantry, commanded by Colonel Clawhammer Witcher, in General A.J. Jenkins’ brigade. Mr. Sias was wounded in the battle of Gettysburg on the third day of the fight, and was left in the hands of the enemy, taken to Point Lookout, Maryland, held eight months and four days, suffering untold injuries. When the word of exchange came Mr. Sias went back to his company, his arm still in a sling, and participated in several engagements, though he could use a revolver only with his left hand, and he would have suffered for something to eat had it not been for the kindness of two good soldiers. Andrew Lewis Sias settled in Lincoln county in 1867, and receives his mail at Fourteen, Lincoln county, West Virginia. Source: The West Virginia Encyclopedia, Vol. 7 (Richwood, WV: Jim Comstock, 1974), p. 137-138. NOTE: Lewis Sias is my great-great-great-grandfather. 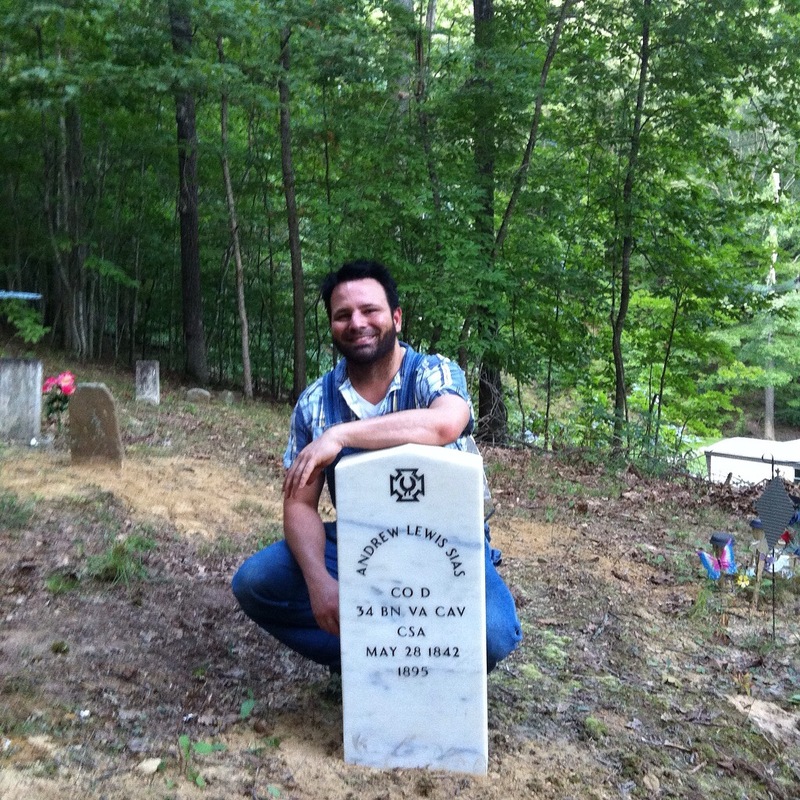 The Andrew Lewis “Lew” Sias Family Cemetery, which I visited on 23 August 2015, is located in the headwaters of East Fork of Fourteen Mile Creek in Lincoln County, West Virginia. Mom and I recently placed a military marker at the grave of Andrew Lewis Sias, who served in Company D, 34th Battalion Virginia Cavalry. Lew Sias is my great-great-great-grandfather. He is buried in the head of East Fork of Fourteen Mile Creek, Lincoln County, WV.